Will the real “gasoline tree” please stand up? The Sierra Club has said many silly things in defense of its lawsuit demanding 100% destruction of all non-native trees on 2,000 acres of public land in the East Bay Hills, and Million Trees has responded to many of them (1). Now Sierra Club has provided a new batch of ridiculous statements in its “pre-buttal” to the letter from a Chapter member to fellow Chapter members. Let’s compare that film clip in Australia with wildfires here in California. Our most recent local wildfire was in September 2015, in Lake County about 100 miles north of San Francisco. The Lake County fire destroyed about 1,200 buildings, killed 4 people, and burned over 76,000 acres. HERE is a film clip of that fire, taken from the dashboard camera of a county sheriff driving through the fire. “Native” trees burning in a Wildfire in California. Bureau of Land Management. As we would expect, the Lake County fire looks very much like the fire in Australia because that’s what wildfires look like. Most start in dry grass and move quickly through the fine fuel. If it is a wind-driven fire, it will move into tree canopies and it will jump over roads. The fire in Lake County burned predominantly native vegetation. You will not see any eucalyptus trees burning in the film clip of the fire. Wildfire behavior in California and southern portions of Australia are similar because their climates are similar. They share a Mediterranean climate in which winter rains produce copious herbaceous vegetation that dries out during the long, dry summer months. The green grass of winter becomes the fine fuel of summer. It ignites easily and if conditions are right (high winds and temperatures and low humidity) quickly becomes a wildfire in which everything burns. The native vegetation that survives these conditions must be adapted to periodic fire. Therefore, native vegetation in California and in Australia are both adapted to periodic fire. Destroying our non-native vegetation will not reduce fire hazards because native vegetation is equally flammable. Many native trees are as flammable as eucalyptus trees. The leaves of native bay laurel trees contain twice as much oil as eucalyptus leaves. A cord of native oak wood contains more BTUs (measure of heat energy) than a cord of eucalyptus wood. Native redwoods are taller than eucalyptus and are therefore as likely to cast embers over long distances. There is as much fine fuel in the oak-bay woodland as there is in the eucalyptus forest. What is a “gasoline tree?” It is a rhetorical device. A Google search for “gasoline tree” turns up a mixed bag of American nativists using that term to describe eucalyptus, and sites about tree species being grown for biofuel as a substitute for gasoline. Calling eucalyptus trees “gasoline trees” is a rhetorical device. A native plant advocate probably made it up, then it was shared in their closed community until it became a “fact” in their minds. It is a means of generating fear. It is a tool used by native plant advocates to support their demand to destroy all non-native trees in California. Name-calling does not alter the fact that if the trees are removed, the landscape will be much more flammable. They will be replaced by grasses and shrubs that will be easily-ignited fine fuels and result in fast-moving fires. This is the second of a series of articles, debunking the latest batch of inaccurate statements made by the Sierra Club in its “pre-buttal” to the letter from a Club member to other Club members. Stay tuned! Well this reminds me of the devious strategy used by those trying to describe spartina alterniflora as a plant that would encourage flooding, which would allow the state of Washington to declare getting rid of it an emergency. Well that flooding potential info was based supposedly on Invercargill New Zealand, a statement that may have been supported by the Noxious Weed Board of NZ. We were able to get in touch with the person who was the head of soil and health in NZ, and he checked around and said that even though New Zealanders might not be happy with the spartina it never had caused any flooding. This was actually confirmed at a conference in Olympia Wa. by a New Zealander who was an official participator–who said he had been asked by the organizer of the meeting to find some evidence of spartina causing flooding. He said there was none. You would have thought that this would ended the spartina eradication project, but not so, and over 20 million dollars later, tons of glyphosate and imazapyr being thrown into Willapa Bay, and elsewhere in the state, the Willapa Bay Shoreline , instead of having a shoreline stabilizer and an effective carbon sequesterer–has gravel being put down to grow manilla clams. And just a footnote to the Californians who bought into the bad science that traveled like a virus from Washington State to California re Spartina Alterniflora. Thank you, Fritzi. Yes, there appears to be no limit to the fabricated “facts” that are used by nativists to defend their destructive projects. I am sorry to say that here in the San Francisco Bay Area spartina is also being eradicated with herbicides. I heard a report on the radio this morning about a new grant for “wetland restoration” in which the announcer claimed that eradicating spartina would benefit bird populations. This claim is being made despite the well-established FACT that the population of endangered Clapper Rail has been decimated by the eradication of spartina. The non-native species of spartina grows taller and more densely than the native, which also dies back in the winter. In other words, the non-native spartina provides far superior cover for the Rail. You might think that the endangered status of the Rail would afford it some protection from this pointless eradication. It is very hard to explain how people who claim they care about birds and the environment are fighting for projects that are clearly harming birds that are dependent upon the plant they are poisoning. Please read the article on which you are commenting. Exploding eucalyptus “Gasoline Tress” is a myth made up by native-plant-only propagandists. Every tree will explode in a firestorm wild fire. The California Bay Laurel has a higher oil content than eucalyptus and California coast live oak have a higher BTU content than the blue gum eucalyptus. Almost all California wild fires have never had eucalyptus trees associated with them. Those fire have started in native plants. 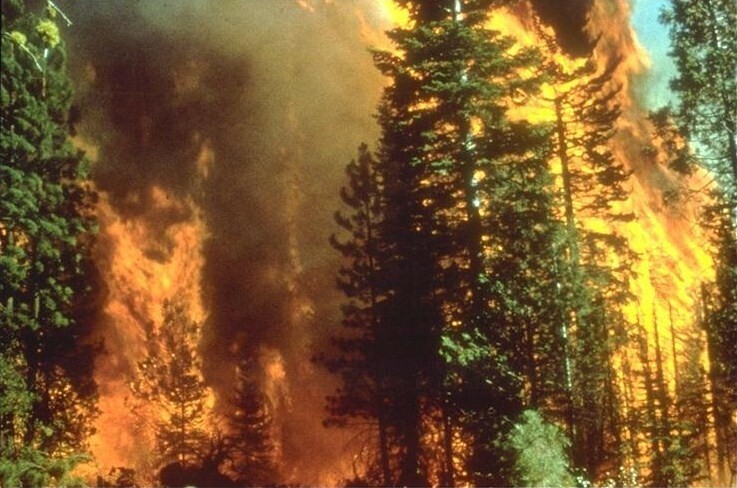 The 1991 Oakland hills fire stared in dry native brush and spread to wooden structures which combined with a strong Santa Anna wind storm and poor fire response cause a fire storm that burned EVERYTHING in its path and did not stop until the wind died down. Brilliant and common sense rebuttal. I lead nature hikes and constantly hear the myths about Eucalyptus (as well as myths about our native animals.) People need to actually think and learn. If the Sierra Club, UC, EBRP, Libby Schaaf, etc., get their way, all we will have left is the most flammable plant of all: non-native grasses. I recently saw the large piles of dry dead branches of native trees in the Mt. Tamalpais watershed. There was a sign about the necessity to cut the trees, which I don’t believe, but no explanation about how flammable the piles of branches and leave were, as if ready for signal fires to be lit. This has been happening for years in the East Bay. If they really believed there was fire danger, they would not leave such flammable fuel.